Similar question: has anyone tried epazote? I saw it listed as a seasoning for refried beans and discovered it's an herb I've never knowingly tasted. I discovered pandan only last year -- what an excellent flavor in sweet things! Yes. Down here we call it Mexican tea. A lot like oregano, but stronger and a little spicy. People down here use oregano if they don't have epazote. Thanks, didn't realize they were interchangeable. Would you put it in chili? It works in chili. But it is stronger than oregano. try epazote in a quesadilla... cheese on a wheat tortilla; or a cream of bean soup with epazote....lovely flavour!! That is an excellent suggestion, Maureen, thank you. It has been abiding for a week at least, think I brined it on the 2nd or third. Bacon, Pastrami and Corned Beef all use the dreaded and feared "pink salt." Think Pink, yo? I encourage anyone interested in memes to check out Lady Gaga's "meat curtains"; with the dress, I digress... Drapes, rugs, landing strips, hardwood flooring. Oopsie! I am in danger of getting off-topic, I need to get back to IFR. This is Corned Beef v1.0b. I am not afraid. I hear botulism is a hell of a trip when you take the wrong turn, but then I am hard-o'-hearing. What? Oxygen is the enemy of botulism, methinks? Google that stuff, keyword botulism, Not Sure. Before I go off half drunk and attempt to put icing on the carrot cake I feel I should address the Oregano question. If I say it thrice... Not Sure. ediot: Dang-on (if yer a gentle mountain stream I'm), dunn furgoat the pic! Geez, I half forgot about this chronicle. The Corned Beef turned out awesome, not too salty and I think I ate the last bit of it a week or so ago. I purchased two heads of Cabbage for the St. Pat's festivities, and ended up only using a half or quarter of that to eat on the day, something possessed me (I suspect the demon Jameson) to attempt a batch of Sauerkraut. I figured I'd give it three weeks, which makes tomorrow the day to eat or can it. By can it, I mean do the whole preserves thing. Or I suppose I could throw it away. The kraut smells like kraut, & I am unafraid. Lawd hep me, eye keed! If savage Irish and Vietnamese have been eating rotted cabbage for centuries, I feel safe in my hipster douche mimicry. ediot: anyone want to hear about the, nah. So how did the kraut turn out? Say compared to the store bought stuff? Lark's Tongue in Aspic, mmmmm! 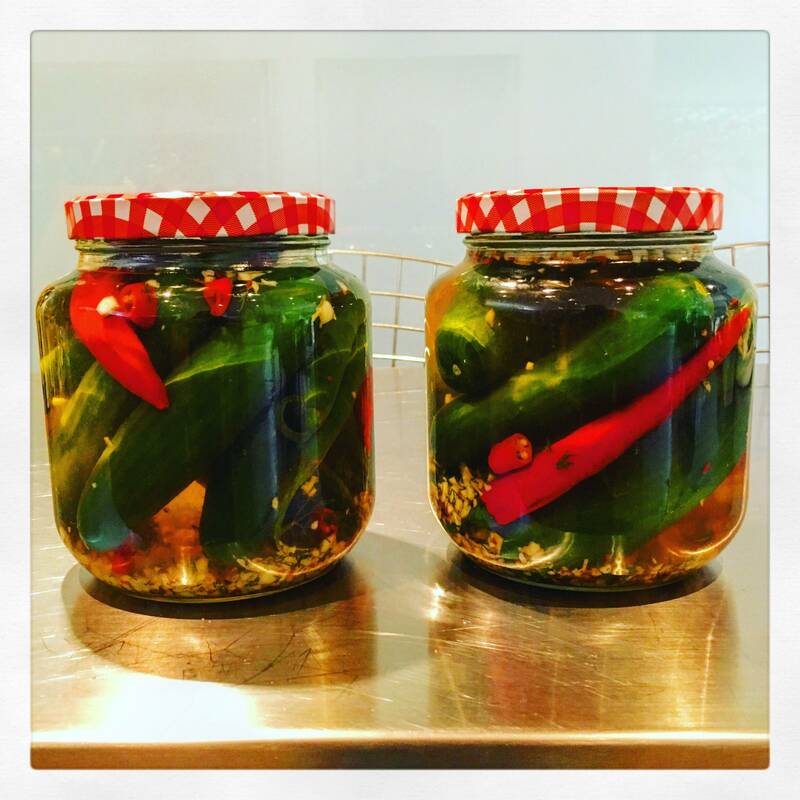 Anyone know anything about pickling gherkins? A friend wants to know. Care to share? The recipe ... and some innuendo. the key is growing your own cucumbers! That is what I do...and , I grow my own dill, garlic, peppers, rosemary, etc...all that goes into the jar! the key is growing your own cucumbers! That is what I do...and , I grow my own dill, garlic, peppers, rosemary, etc...all that does into the jar! If I want to spice it up should I role play add chilli peppers? We're still talking about food right? OMG yes! put the peppers in there! I do that and so do many! My grandmother used to make it like that and I'm kicking myself that I never got her recipe before she passed. YouTube! you can come 99% close doing it yourself! Just try! I know there is plenty of recipes online but with this type of thing I like to ask strangers I know online. Yeah that makes sense. Chefist, what size gherkin do you like to work with? Chefman, I take a schwing at this one? How early did you plant the cucumbers? Mini0ts don't care too much about how big they are when you drop them into the brine. Exactly why I didn't mention sousing the gherkin. Lol just saw this! Armenian sized! Where can I get Chefist and what dishes can I make with it?